MESA, Ariz. -- Saying he was there to lend support for victims and their families, Chicago Cubs first baseman Anthony Rizzo chastised anyone who claimed he was making a political statement when he returned home to Parkland, Florida, in the aftermath of the school shooting there last week. 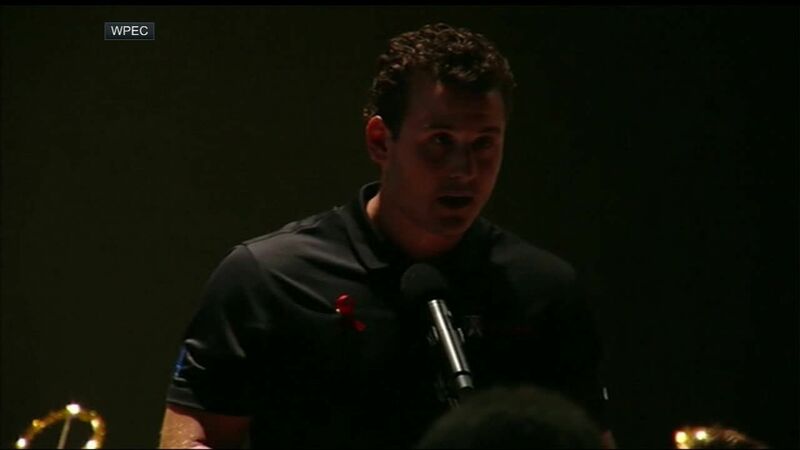 "I thought the speech was important, to speak with the kids and families that were affected," Rizzo said Monday morning at a news conference from Cubs spring training. "I'm really proud to see what Parkland is doing and what the kids are doing and speaking out. And trying to make a difference. I stand behind my community. "To be very clear, I did not say the word 'gun' one time. Anyone out there who wrote I'm calling for gun control is very irresponsible. I did not say that once. I don't know enough about it. I don't know what needs to be done, but some type of change needs to happen for the better." Rizzo, 28, is a graduate of Marjory Stoneman Douglas High School, where Nikolas Cruz is accused of fatally shooting 17 people last Wednesday. Rizzo's ties to the community run deep, and he knew some of those who were killed, including a football coach and the niece of his agent. "He's a true hero," Rizzo said of assistant football coach Aaron Feis. "He has this monster coming in, shooting up the school, and he jumps in front of kids and saves their lives." Rizzo stressed that he doesn't have all the answers, as he's "just a baseball player," but it's obvious to him things can't go on as they are. "I said there needs to be change, but I don't know what the change needs to be," Rizzo explained. "I think it's good for the kids to go out and show they have a voice. For them to be outspoken about it, it shows they're not going to sit back and be another statistic." After the Thursday vigil, Rizzo met with families of victims and visited with other survivors at a local hospital. He returned to the Cubs this past weekend to begin spring training, but he says his heart will always be in Parkland. He was asked what his thoughts were when he first heard the news of the shooting. "When you first hear 'shooter,' I took my next golf swing," Rizzo admitted. "That's how numb our country is to it. ... My parents were one of the first homeowners in Parkland. I've seen that community grow into what it is now. It's crazy to see that happen at home." Rizzo isn't sure how he'll honor the victims this season, but the Cubs have assured him they will help in any capacity, and he's confident some good will eventually come out of a "gut-wrenching" time in his community. "They will be in my thoughts and prayers every day," he said. "They're going to turn this tragedy into something really positive." Anthony Rizzo, a native of Parkland, Florida, expresses sympathy for victims of the mass shooting at his high school.